Did you hear the news? Yesterday Dropbox gave an overview of Project Infinite, which was officially released last month. 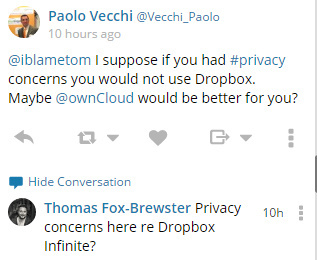 According to the Dropbox blog, “Project Infinite is designed to enable you to access all of the content in your Dropbox—no matter how small the hard disk on your machine or how much stuff you have in your Dropbox.” Makes sense, every user should be able to access THEIR data. But there’s a catch, one which many people are not thrilled about. Uh, what? They’re “actively play[ing] a role in your filesystem?” Just looking at some of the reactions on Twitter to this announcement, many are less than happy, one might even say angry or “freaking out,” about this new development. 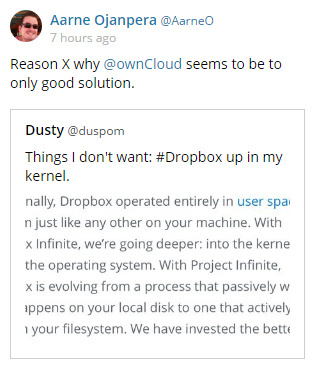 And many are even suggesting a move to ownCloud, which of course is flattering. We have been discussing the ownCloud virtual filesystem for quite some time. This is our version of project infinite, but completely under your own control. 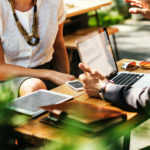 In the spirit of being open, we don’t have all of the answers here, but I do encourage folks to take a look and see if they have anything to add, because this could be an awesome feature for everyone!With ownCloud users always have access to their files and because it is installed on your own system rather than into a third party cloud, ownCloud will never be able to “play a role in your filesystem.” You retain 100% of control over your files, as well as 100% privacy from prying eyes. 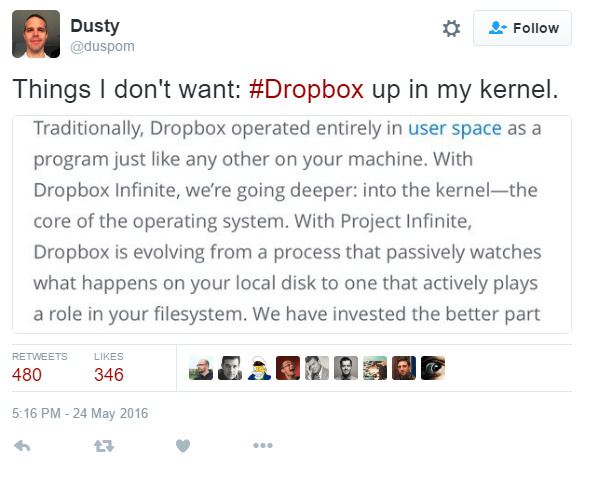 DropBox is proprietary software. 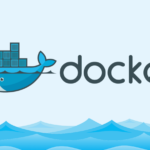 Even as a userspace application, there is already a lot a DropBox client could do to spy on a user or compromise their security, and because nobody can see their source code, there’s no way to do know if it is doing these things or not. Letting this same proprietary software have access to kernel space is laughably absurd. 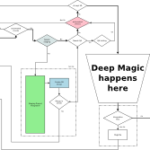 As far as security goes, you might as well just share the contents of your entire filesystem on a public BitTorrent site, and stream feeds from any mics, cameras, and GPS units hooked up to your device (or built-in) on a public website. 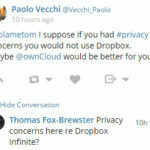 Well and the fact that Dropbox’s user agreement also indicates that they have rights to use your files for whatever they want. I mean it makes sense there service is “free” and they need to make a profit somehow and it sure ain’t through adverts.